Abstract Admissions: Haaaave you met Elvis? I’m not really a pet person. Thus far I have owned only 2 pets in my lifetime. The first being a lost parrot, which landed up tired at our doorstep, when I was very small. So my mom took it in and we looked after it for some time. The only thing I recollect about this parrot was that (1) It used to eat guavas and spit out EVERY single seed everywhere! (2) We never used to cage it and it was used to roaming around freely in the house. One day it was missing and the maid found it electrocuted below the refrigerator, where apparently it had been pecking on the wires. Tragic. But frankly, I was too young to really remember much. The next pet or should I say pets, that we owned were fishes. Nothing fancy; just a small and simple aquarium with a couple of aquatic plants, a few smooth pebbles scattered around for aesthetic purposes and a small number of common aquarium fishes. My brother and I were supposed to take turns to clean the tank but since both of us were/are pretty lazy gooses, many a time, the poor fishes must have cursed us to damnation for letting them swim around in dirty water. Fed up with our negligence, our parents often threatened to give the fishes away. The final straw was this incident. It had been exam-time, and so neither of my brother nor I, were going to spare any time for fish-tank-cleaning activities. By the time the exams were over and I had gotten over my laziness, the water was so extremely sinister looking and foul smelling that the Loch Ness monster would have loved it; I finally took pity on the fishes. I managed to transfer all the fishes into another container, except one. This one was quite a big fish with long whiskers and was well known to thrash about a lot when caught in the net. So you will empathize with me when I say that I was pretty nervous. I had emptied half of the murky water with weeks of fish crap, slimy moss and other such god-awful things into a bucket and then decided to take a break to contemplate my next course of action. I sat, rested my leg on this bucket and was trying to bring up my courage to catch the whiskered terror. So deep in contemplation was I, that involuntarily, I kicked over the bucket. In an instant, our entire living room was flooded with water that must surely have had alarmingly high toxic levels. Call it crazy coincidence, but it was precisely at that moment, that we had a neighbour drop in with another visitor! God knows what they must have thought! Needless to say, the rest of the day was spent cleaning the house, by pouring bucket after bucket of water and emptying a bottle of strong detergent. That marked the end of our tryst with pet fishes. Neither have I had much luck with dogs. Although I never owned one, some of my friends have. One day, while I was visiting somebody, for some strange reason their dog started chasing me. I ran for dear life and that must have probably made the dog more determined to get a hold of me. At the spur of the moment, I had this brilliant(!) idea that it won’t follow be up the stairs and so made a dash for the terrace. But surprise! It bounded right after me up the stairs and had me cornered and cowering at the very end of the terrace’s parapet wall. Thankfully, by this time, hearing my strangulated cries, the dog’s owner came up and led him away. I am sure that if the dog had taken even one more step towards me, I would have blindly jumped off the terrace! So this being the state of things, I don’t think I am ready to have pets. Pets require too much attention and care and I am just not ready to take on that kind of responsibility. Plus they die. I mean come on! You put in so much effort and time and energy and money and love and care and what-not - and in the end they go and die on you. Not fair. It is enough that the people I love will end up dying some day, let alone the animals too. Now let’s come to the star of this post. Elvis. The sweet little African Grey Parrot at a friend’s place. I have indeed heard so much about talking parrots but I’ve never really come across one. But boy! Can Elvis talk! If he knows you reasonably well, he will imitate you to perfection. 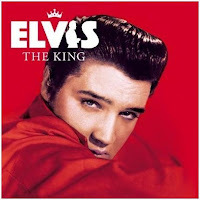 The other day, I was in one room and I thought that Elvis and my friend were having a conversation. It was only after a while that I realized that my friend wasn't there at all - Elvis was talking so exactly like my friend that I was simply amazed. But the most charming thing about him? He happily whistles an old Hindi number and once done he congratulates himself saying “Bravo, Elvis Bravo!” in his parroty voice! Now if that’s not cute, I dunno what is! I’ve only met Elvis a couple of times and both of us are pretty scared of each other. (Don’t you smirk! He’s got really sharp claws and an even sharper beak.) But I must say that he is a real darling! 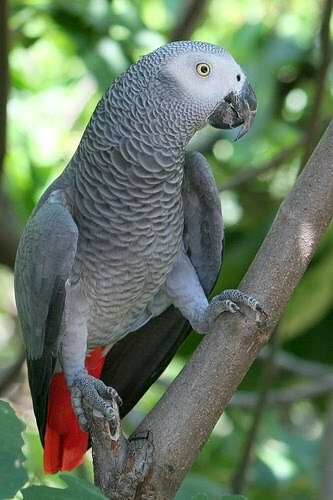 His grey plumage with a red tail doesn't make him as pretty as the other green or multi-coloured parrots, but the African Grey is said to possess intelligence nearly equivalent to that of chimps, dolphins and even human toddlers.And they have quite a long lifespan too! Oh btw, Ajay does a really comical imitation of how Elvis walks - those of you who know him, please ask him to show it to you when you meet him next! It is hilarious and I can’t stop laughing when I think about it! Okay forget my cheesiness and check out this celebrity African Grey - Einstein! Have fun! Thanks for the confidence vote Neeru! lol!